Resumo The VSG2260 is a L2+ managed switch designed for small to medium sized businesses. To cater for high bandwidth traffic, it is equipped with 20 Gigabit Ethernet ports for the LAN side, and 6 Fast Ethernet SFP ports, 2 of which are for fiber and the other 4 can be used for either UTP (Ethernet cable) or SFP (fiber) connections, for the backbone side. It has security features to meet the needs of managing local and remote access to the network. Furthermore, it has VLAN capability to allow flexible network design, and QoS capability for flexible bandwidth control. It supports 802.3az energy saving standards, sFlow network monitoring, IPv6 and IPv4 and many other functions. With preset options for configuring network devices and plug and play features,G 2260 switch is truly an ideal solution for business grade network infrastructure. Advanced security for remote access, IP Source Guard, 802.1x access control, etc. Network security is a lifeline for modern day businesses, and is multi-faceted. To manage remote access, VigorSwitch 2260 supports SSH, SSL and SNMPv3 connection with encrypted packet content for each session. To prevent illegal access of data ports, it supports IP Source Guard which blocks illegal IP addresses for accessing specific ports or receiving data packets. To manage access to port-based network devices, it supports IEEE 802.1x port security standard. And, to prevent illegal logins, it supports Access Control List (ACL) function, ensuring only authorized users can access designated network resources. VLAN provides a way for businesses to assign network functions to different workgroups, branches, sections, employees or visitors, according to their operational requirements. VigorSwitch G2260 offers the Layer 2 Isolation feature (tag-based) VLAN for the groups. You can also use network devices' MAC addresses for the VLAN profiles (MAC-based VLAN). The Voice VLAN function of VigorSwitch G2260 assigns a preset VLAN profile with appropriate level of QoS for VoIP traffic. This ensures that voice related traffic will not be delayed because of inappropriate priority treatment. VigorSwitch G2260 is equipped with advanced QoS features to ensure that traffic for various applications are treated with the desired priorities. It offers classification types including: port based, 802.1p VLAN priority based, IPv6/IPv4 precedence, type of services (ToS), DSCP based, Differv classification and remarking ACLs, Trusted QoS, etc. There are 8 priority levels based on 8 hardware queues, and these can be linked to time scheduling for upmost flexibility. With the increasing number of mobile devices joining PCs and servers in business environment, the configuration of network switches can be a source of frustration. VigorSwitch G2260 comes with preset options for network devices such as IP phone, IP camera, Wireless devices, etc. The web based configuration pages allow you to just select the well sorted options, such as security and network features (ACL, IP Source Guard, VLAN, QoS, etc.) as required. 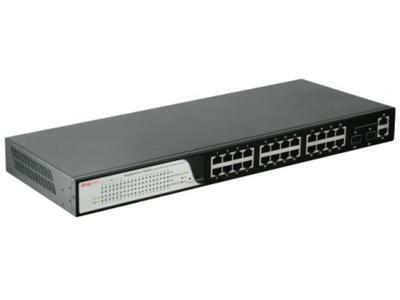 VigorSwitch G2260 supports Universal Plug and Play (UPnP) features, making it easy to connect network devices including PC, server, IP phone, IP camera, Wireless AP, etc. And with the ample number of Gigabit Ethernet ports on the LAN side and the UTP/FTP ports on the backbone side, these features make building up of business network infrastructure a lot simpler. Following DrayTek's green product policies, VigorSwitch G2260 complies with IEEE 802.3az Energy Efficient Ethernet standards. When it detects that the network is idle it will turn to Sleep mode. Also, it detects the cable length automatically and send the packets with just enough power for the devices. In this way, it saves power consumption costs, being environmentally friendly while maintaining high performance levels. Often the network administrators need to monitor data flow on each port for the purpose of accounting, billing for usage, security checking, performance optimization, etc. VigorSwitch G2260 supports sFlow sampling protocol, allowing monitoring of network traffic without interrupting data flow or compromising traffic performance. VigorSwitch G2260 supports both IPv6 and IPv4 ensuring ongoing conformity of IP network standards.